Things you can do to reduce condensation and mould. What can you do to reduce or eliminate condensation and mould in your home? Can you stop condensation on windows and walls ? Is it possible to stop condensation without spending a lot of money ? "Mold in different rooms in your home ? You have a condensation problem"
Living with condensation and mould is at best an irritation, and many of our customers tell us that they feel it's affecting their health. So what measures can you take to improve things? First things first. Are you sure your home really has a condensation problem ? Our Damp home diagnoser tool should point you in the right direction. ... then you may find condensation is a problem. What causes condensation and mold? Condensation is caused by humid air inside your home that cannot escape to the outside. It is important to understand that it is not caused by damp outside that is trying to get in. Problems can occur from 'penetrating' dampness (water coming in from say leaking gutters or defects in the walls) but these are always confined to a single area in your home. If you have mould in different rooms in your home then you have a condensation problem. The more people that live in a house then the higher the chances of condensation occurring. Likewise the smaller your home is, the higher the chance of condensation. So for example four people living in a three bedroom house are much more likely to have a condensation problem than one person living in the same sized house. But the most important factor that affects condensation in the home is how 'air tight' your home is. In the race to make our homes ever more energy efficient we've been told that draughts are a bad thing. Most of us have draught proof doors and windows and we've sealed up the gaps in our homes. Add into the equation the increased number of showers and washing clothes more often, and the fact that children tend to spend longer in the home nowadays. So it's no surprise that air quality and condensation are a problem for many families. Mold (or mould) will happily grow wherever there is sufficient condensation. And as condensation always starts in the cooler areas of your home where air does not circulate easily then this is where mold grows first. In this guide we are going to avoid advice like "leave the windows open" or "don't dry clothes in-doors" as we recognise that these are simply not practical measures for many people. Leaving windows open will make your home cold and is a security risk. In winter many people have no option but to dry clothes inside. However there are things you can do and changes that can help. Allowing air to circulate around your home will help reduce condensation so it's a good idea to leave doors open (especially to the bedrooms) during the day. Bedrooms are often the first place condensation occurs. Why ? because throughout the night we create humidity in bedrooms from breathing and perspiration - and this is the time when the temperature of the rooms falls to its lowest point. These are perfect conditions for condensation to form. And where condensation regularly forms then mould will follow sure as night follows day. So leaving bedroom doors open or ajar overnight will help air to circulate and reduce condensation. This is particularly true where there are two people in the same room. The worse room in the house to have a wardrobe is probably the master bedroom. The bedroom wardrobe is the perfect place to breed mould. It's usually full of clothes and the doors are shut. So it's cool with very little air circulation and it's in a room with one or two people providing a steady supply of humidity throughout the night. So it's no wonder that one of the first signs of mould are when your clothes start to smell stale and foisty (but you may have become accustomed to the smell so it might be worth asking a friend for an honest opinion). Keeping the wardrobe doors open all the time will help with that essential movement of air that's needed to avoid condensation. In fact you should think about where you store 'vulnerable' clothing (leather and suede attracts mould first). Maybe the wardrobe or the master bedroom are not the best place at all. 4. Shower in the morning & open the bathroom window ! Leaving windows open all the time can make your home draughty and cold, however it's a great idea to open the window when having a shower. The shower produces a huge amount of humidity which will then condense on the colder surfaces in your home. So opening the windows - and training your teenage children to do the same - will get rid of most of that humidity. Ideally windows should be left open for at least half an hour afterwards. A simple check of the effectiveness of your bathroom fan is to hold your hand, or a piece of paper against it. You'll get a good feel for how much air it is drawing from the room. We find that many fans are noisy but not at all effective. This may be because they are simply cheap and ineffective but we often see fans that are not installed correctly. Fans with long lengths of flexible ducting that snake through the loft are unlikely to work well. There is definitely a right and a wrong way of installing an extract fan. Modern 'condensing' tumble driers seem to offer the convenience of an appliance that can be located anywhere in the home, and the effectiveness of a 'vented' drier (that is a drier that has an exhaust vent through the wall to the outside). Condensing tumble driers capture the humidity as water in a compartment that is then emptied. Unfortunately we find that in reality a lot of humidity escapes condensing driers. So if you can, store your condensing drier in a room where the windows can be opened when it's in use, or even better store it in a garage or out-building if you have one. When installed correctly, cavity wall and loft insulation are very effective. Your home will be warmer and cheaper to heat. However we often see homes with poor loft insulation - either too thin, or insulation that has been disrupted over the years. Your loft should have around 250mm (10") of loft insulation. It is important that it is laid correctly - there should be no gaps in the insulation since this will lead to cold spots on the ceiling which will attract mould. Loft insulation is a very worthwhile measure but if not installed correctly it can choke off the supply of fresh air to the loft which can cause the roof timbers to become damp. Most houses have timber floors with a gap between the floorboards and the ground. This sub-floor void should be ventilated. 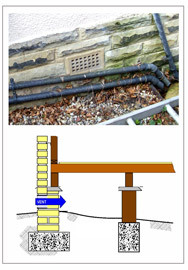 Over the years building regulations have become more stringent and the number of air bricks required around the base of an outside wall has increased. These air bricks allow air to pass under the floor and help keep the floor timbers dry. However we often see vents that are blocked, or are partially obscured by decking or a raised path. A well ventilated sub-floor void (and for that matter a well ventilated loft) helps improve the 'health' of a house or bungalow. Houses that have concrete floors and therefore no ventilation beneath the floor are always more prone to condensation and mould. 10. If you have window trickle vents, keep them open. We believe that the background movement of air in your home is essential for a healthy environment, and so having a gap under doors is important. This is particularly so for bedroom doors since the bedrooms are the major source of humidity in your home overnight and its overnight when temperatures fall and condensation becomes more likely. 12. Think about the impact home improvements may have on ventilation. Last - and by no means least - is a checklist of changes to your home that may have unintended consequences. Homes that have a problem with condensation today were probably fine when they were first built. It's the changes made over the years that bit by bit have caused the problems you have today. Is it humidity sensing ? How will it vent to the outside ? Does it have a boost mode for when the bathroom is very humid ? Be aware that this will remove a source of fresh air for the room that has the fireplace. If your home has condensation problems now, increasing the size of your family will make it worse, and this is especially true if there will be three of you in one bedroom. Talk to the installers and ask them whether the insulation will reduce the amount of fresh air coming into the loft. If the decking covers air bricks at the base of a wall then make sure there are gaps to maintain the movement of air. Be very carefully when raising the level of a path. Will it breach the damp proof course ? Will it allow rain to splash against the walls above the damp proof course? It's good practice to install a narrow trench with pebbles or gravel in so that the path is not directly next to the wall. We are having a new shower installed. Will it create more humidity ? Is your bathroom fan up to the job ? consider installing a trickle vent in the bathroom window. We are going to have a conservatory built. Talk to the installers about ventilation. Are they fitting trickle vents in the windows ? Conservatories can cause ventilation problems because you 'lose' an outside door. Outside doors usually allow a small amount of fresh air in in the form of a draught. Stopping draughts may sound like a good idea but they are a useful source of fresh air. A standard surveyor's report is unlikely to cover condensation. Ask the the current owners if damp is a problem. Ask the surveyor to consider this during the survey.